Newdelhi:6/11/18:The 5th edition of the 10-day “Women of India National Organic Festival 2018” organised by the Ministry of Women & Child Development culminated on the night of Sunday, 4th November, at the expansive grounds of Indira Gandhi National Centre for the Arts, Janpath Road. 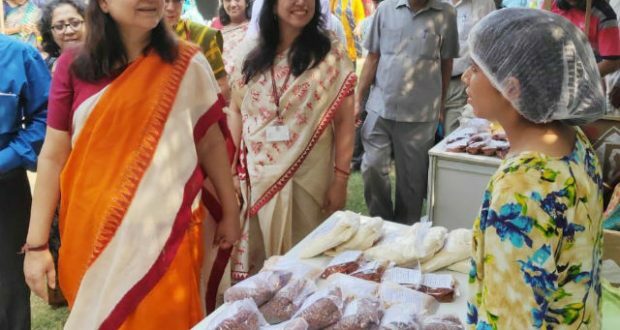 Over the 10 days, women farmers and entrepreneurs from across the country, participated with vast variety of organic products ranging from food and fabrics to wellness and personal care participated in this festival, which is an annual affair. This year, the total sales by the women farmers and entrepreneurs who came from 26 States, were a record of over Rs. 2.75 crore, up from Rs. 1.84 crore in last year’s edition that was organised at Dilli Haat, INA, New Delhi. The festival is expected to have had footfalls of nearly 12 lakh. The success of the Organic Festival has added to the joy of the women farmers from diverse as well as far off corners of the country, such as Majuli, Kangra, Leh, Palakkad, Chikkmaglur, Yavatmal, Dimapur and Almora, among others. Participants had the opportunity to travel and stay in Delhi free of cost for the entire duration of the Festival while enjoying the experience of selling their wholesome goods to Delhiites, who thronged the lawns of IGNCA, not only on weekends, but also on weekdays. This year saw the grand debut of the Food Court and Vegan Food, which were very well received by all visitors. The Women of India National Organic Festival 2018 was inaugurated on 26th October 2018, at IGNCA, Janpath Road by the Union Minister of Women and Child Development, Smt. Maneka Sanjay Gandhi, who has been instrumental in creating the only festival of its kind in India. She also did her Diwali gifts’ shopping from the organic festival, an example followed by several people who made return trips to IGNCA, to make their gift basket unique. The Festival, which was held from 26th October to 4th November, saw a regular stream of people from diverse walks of life on all days, giving immense encouragement to the earnest efforts of all the participants. The main objective of the Festival has always been to support and encourage women and women-led groups that promote organic farming, thus supporting their local community’s economy, creating jobs and keeping farmers thriving, in addition to spreading proper awareness about the benefits of organic products. “The response has been overwhelming,” said Ms. Anamika, an entrepreneur from Mumbai, whose stall had bamboo toothbrushes and steel straws, which were “a hot favourite, even among the youngsters”. While she spoke about creating awareness among people, the encouraging response at the Festival was “the best thing possible”. Ms Sarabjit Kaur, a farmer from Punjab who came for the Organic Festival for the first time registered her happiness at being in Delhi. “This is the first time I’ve come here and am heartened by the positive response our multi-grain products received. I’d like to thank the Ministry of Women and Child Development for giving us this opportunity,” she said. Ms Aparna of AIM for Seva from Tamil Nadu, said she didn’t anticipate the amount of sales at this year’s festival, which she credits to the rising awareness among people. Her stall stored 30 different varieties of organic, indigenous and heritage rice from the states of Tamil Nadu, Kerala, Manipur, Odisha, Karnataka and West Bengal. “The Chakhao Poireiton [rice from Manipur] and Gobindobhog [rice from West Bengal] were completely sold out, and we’re glad for this response,” she says. The participants of Women of India National Organic Festival 2018 also had the opportunity to enroll themselves in Mahila-E-Haat, which is an online marketing portal set up by the Ministry of Women & Child Development, to meet the aspirations and needs of women entrepreneurs. This unique e-platform exponentially strengthens the socio-economic empowerment of women beyond the Festival. The Women of India National Organic Festival is an annual affair and serves as a platform to celebrate and promote women farmers and entrepreneurs from different corners of India.